Aquis Plaza shopping centre to be built in the heart of Aachen pedestrian zone. In terms of architectural features and urban development, the mega-project is expected to be carefully integrated into the character of the organically developed city centre. Its high-quality construction and elegant design ties into the surrounding historical structures. 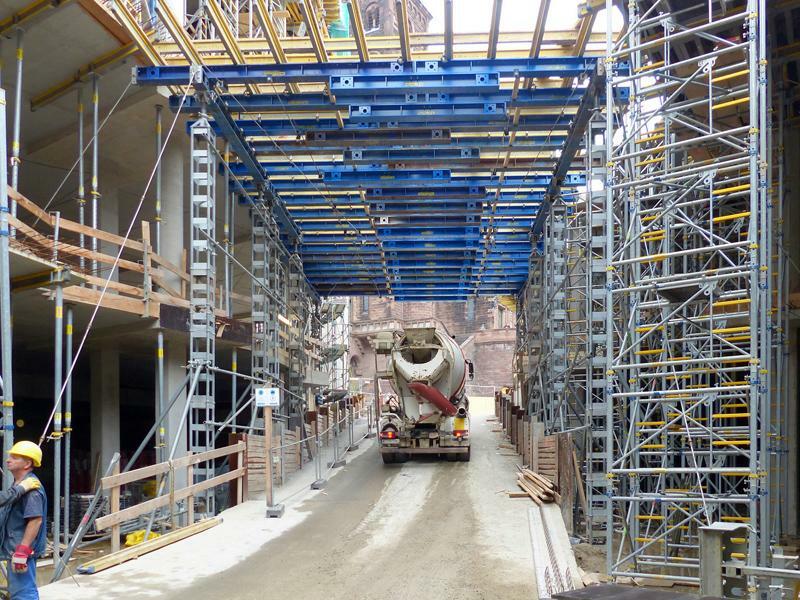 Doka convinced with prompt availability and ready-to-use services on questions relating to formworks. Coordination of various works in confined spaces is one of the greatest project challenges. There is virtually no room for storage and only one road to access the 100 x 200 m area in the imperial city. On peak days, it accommodates up to 20 trucks carrying building materials, concrete and formwork. A masterful performance in logistics by building contractor Ed. Züblin AG, the General Contractor for the turnkey shopping centre. Hence, it was important to find a formwork partner with a product portfolio that allows for realisation of extraordinary jobs. At the same time, the ability to procure large volumes of formwork just in time and with the shortest-possible lead time was crucial. Moreover, lack of space required that part of it be pre-assembled. 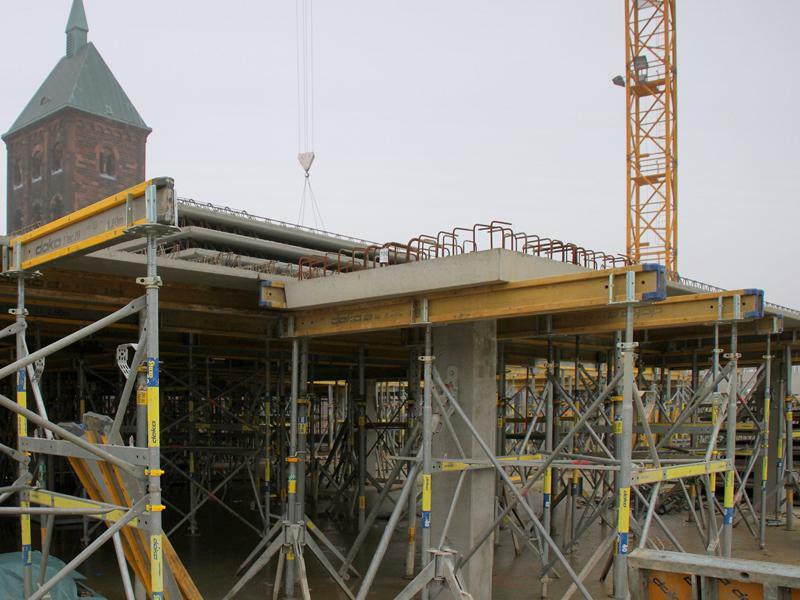 The decision in favour of Doka as the single-source formwork supplier was made quickly. The shopping centre is situated in a triangle formed by the borders of three countries: Germany, Belgium and the Netherlands with a catchment area population of 1.2 million. According to the Hamburg-based ECE Contractor, it's an ideal location. Starting in autumn of 2015, visitors will be offered goods from roughly 130 speciality shops. The retail space includes 29,200 m2 distributed over three levels. A car park with 600 parking spaces is available on the two upper floors. It is accessed by an intricate, spindle-shaped parking ramp and connected to public roadways through a tunnel. The 3rd and 4th upper levels accommodate apartments. This project with its shopping mall is characterised by organic shapes such as the overhangs of the false ceiling to the large-scale glass roof. This is to say that there is virtually no right angle in sight. Rather, with its curved shapes the entire body of the structure is nestled against the buildings long the streets of Aachen's historic centre. At this project, the region's largest construction site, cast-in-place building construction is combined with the use of (semi) pre-cast members. Soon work on the structure shell will be completed as scheduled. The project has already gone through following phases: The first step was to lay the foundation. Then came completion of the base plate that extends across 15,000 m² and is up to 100 cm thick. The next task was building an "access dam" descending into the interior of the structure. It has to be freely accessible to vehicles throughout the entire period of construction. It serves as the lifeline for the entire cramped site's logistics. Doka project engineers planned and calculated a structure equal to the task. 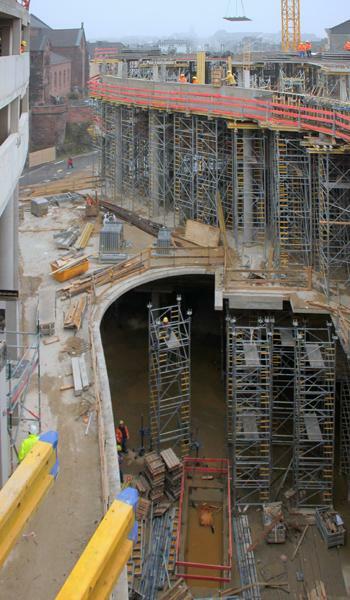 It is 9.0 m high and spans across 7.0 m. The heavy-duty supporting system DokaShore bridge formwork comes into play here. It is composed of high-capacity columns and system beams from the modular system SL-1. Its type-tested columns absorb individual loads up to 430 kN. Above this base support, jobs can be done safely and on time. Underneath the construction site traffic can move freely. The building interior features some large and curvy open storeys. They are bridged by components from the modular system SL-1. Load-bearing towers up to 9 m high are set-up on the profiles of their SL-1 beams. They serve to shore up the 40-cm thick floors of the next levels. Some Staxo towers are back-stayed so they can safely absorb higher horizontal loads as well. 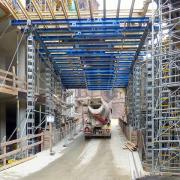 With its rugged steel frames, Staxo 100 is designed for great shoring-heights and high loads. It unites high load capacity and safety, in every situation. Many experts acknowledge that the equipment is highly adaptable to different layouts. This is where the basic frames with 0.90, 1.20, and 1.80 m in height come in. The distance between them can be set anywhere from 0.60 m to 3.00 m. Easily adjustable screw jack heads and feet allow for exact, infinitely variable height adjustments down to the millimeter. In many areas the floors must be continuously supported through to the basement. This is a result of the building's particular static engineering. As a result, a fairly large quantity of load-bearing tower Staxo 100 is required. 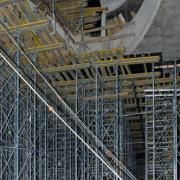 Doka's solid web beams are used in the superstructure. Depending on the load, either H20 beams with blue ends are selected or the new composite formwork beams I tec 20 with grey end-reinforcement. Both beams weigh nearly the same. However, due to their particular design, the composite formwork beams can handle around 80% higher loads. This saves on equipment and above all hours of work. On levels with apartments and car parking spots, floor heights are up to 3.0 m only, with floors 25 cm thick. 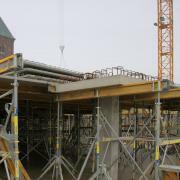 These floors are formed in with the particularly adaptable Dokaflex 30 tec floor formwork. 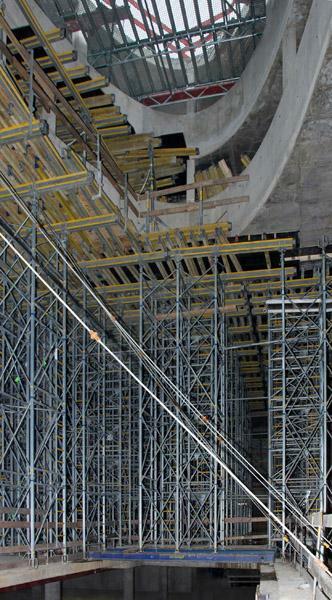 The heavy-duty composite formwork beam I tec 20 is used as a primary beam in this Flex system. This means that significantly fewer floor props are needed as they are spaced further apart. Dokaflex 30 tec can be used to support pre-cast floors. The same goes for forming in complete cast-in-place concrete areas in infill zones. Usually, work up here involves pre-cast columns, column heads and floor panels. Docking heads are bolted to the pre-assembled columns while they are still in the horizontal position. Then the crane will lift the columns into position. Now it's only a matter of hooking in the adjusting struts which are automatically secured with the gravity pawl. There is no longer a need to climb up a ladder to tighten screws. This way the reinforced concrete columns can be placed and plumbed quickly and easily from the beginning. Crane time is significantly reduced. The same technique is used for setting up hollow walls and ensures a fast past there as well. Even the 20-cm thick 2.5 x 2.5 m column heads weighing 3.0 t are pre-cast members. They are resting safely on two composite formwork beams I tec 20 shored up by two Staxo 40. This structure ensures the ease and speed with which the column heads are plumbed and aligned. Elaborate bracing is no longer necessary. A gap of approx 3 cm separates them from the adjacent pre-cast floor panels. It allows for tolerances when producing the pre-cast members and will be formed from below. 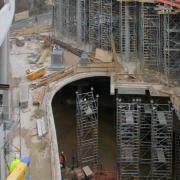 "Wherever you look at this site you see Doka formwork being used. There is a reason for that", reveals Marcus Karr, Operations Scheduling, Ed. Züblin AG. "We performed a holistic project analysis in advance and then made a deliberate decision in favour of Doka. With Doka we not only get mature technology but also technical consulting, static calculations, pre-assembly on site and great support from formwork instructors." Another important component is the orderly return of rented materials. Here, the formwork to be returned is assessed jointly. However, site conditions do not permit on-site acceptance. Thus, acceptance takes place at the Doka storage site. "Doing so requires fewer site staff and, incidentally, it also reduces rental time", says a delighted Marcus Karr. During the construction phase, Züblin takes advantage of the customer portal myDoka. It can be used any time to access project and site-specific data – conveniently from a PC or tablet at the office or on site. myDoka offers easy management and guarantees confidentiality of data as well as an optimal interface to the Doka team. The Aquis Plaza project is a continuation of the partnership-oriented co-operation enjoyed by Deutsche Doka and Ed. Züblin AG for many years. In the past, the two companies collaborated successfully on several large-scale projects, including at CityGate Stuttgart, the College of Applied Sciences Düsseldorf-Derendorf and the European Central Bank (ECB) in Frankfurt/Main. Thank you for your interest - Large-scale project on minuscule footprint. Thank you very much for your interest - Large-scale project on minuscule footprint.